A huge component of the Internet of Things phenomenon is focused on home security and maintenance. You want to guard against prowlers and burglars, but you also want to see how kids and pets are getting along while you’re at work and make sure you’re alerted to potential disasters like overheating or water leaks. 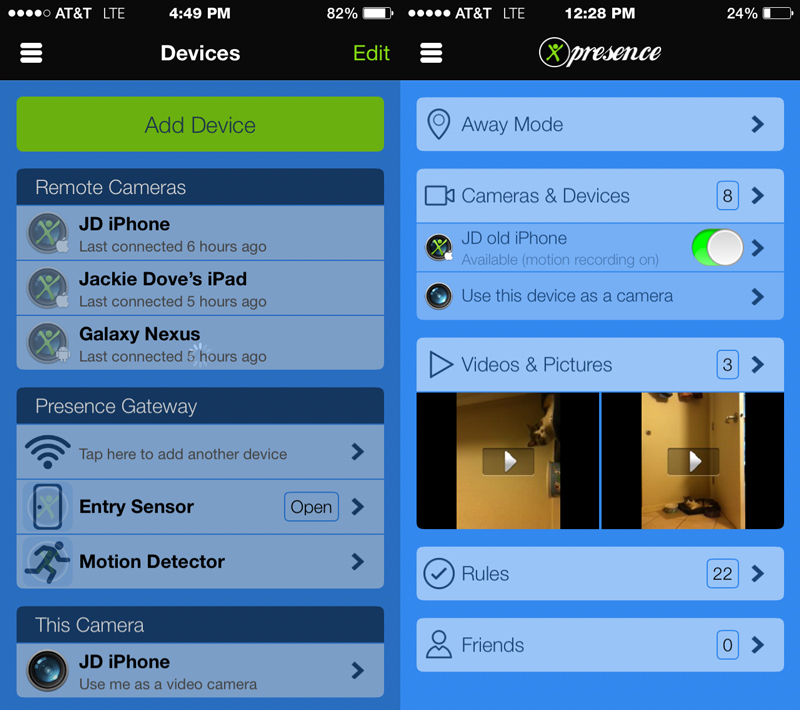 Presence Security, launched in 2013 by People Power, started life as a free app that pairs with castoff iOS and Android devices to create a wireless home monitoring system. It has now evolved into a wider, more inclusive system complete with its own connected hardware. 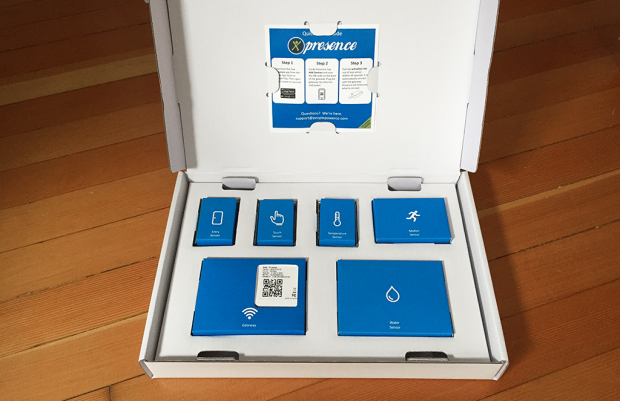 Presence Security ships to backers today, and is now available for the public to order, in the wake of a successful Indiegogo crowdfunding campaign. Presence Security, which reached its initial crowdfunding goal of $20,000 on day one, was 437 percent funded at the close of the 30-day campaign. The Basic hardware-software system combines the free Presence app with a number of physical sensors to monitor entry, motion, water, temperature, humidity and touch. The highest-level package includes six entry sensors, three motion sensors, three touch sensors, 2 water sensors, a temperature sensor, a humidity sensor and the gateway. It offers a broad overview of your home environment, while at the same time allowing users to focus on areas of interest such as a particular drawer or pet water dish or the playroom. 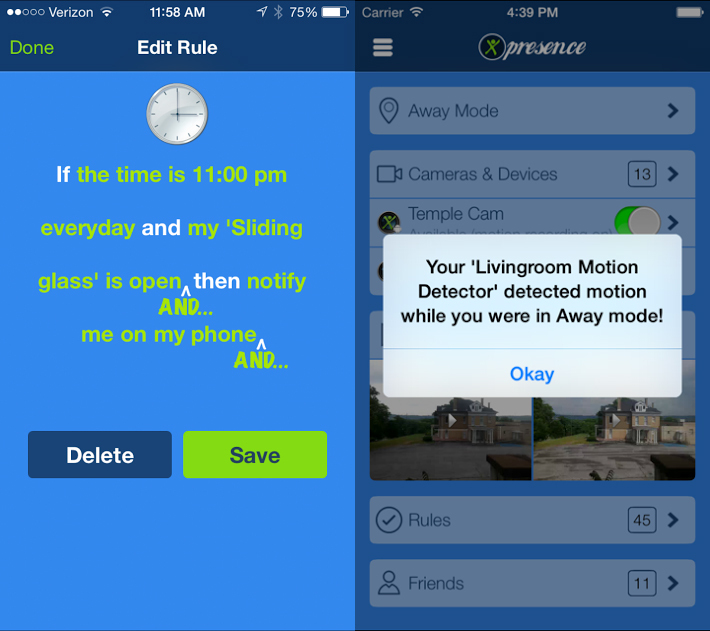 A new friends and sharing mechanism lets you coordinate actions and share alerts with family, friends and neighbors, to help watch over your home while you’re away. The system also supports two-way conversations when your camera and audio are enabled, for communicating with loved ones at home or just hearing your cat purr. The app gives you 50MB of server space for free, and will eliminate the oldest videos when that space fills up. A Pro Video option lets you sign up for a 7-day pass or a monthly or yearly subscription giving you 50GB of storage. A Pro Video account gives you faster, longer and better recordings, the option for an alarm and more. TNW got one of the first review units, and I was able to set up the system within a few minutes. The system is plug and play: You add a monitoring device via the software while the Gateway is connected to the Internet. After you sign into the app, a menu appears as you survey the equipment you want to use and decide how you want to use it. Using my current iPhone as the hub and device controller, I set up an old iPhone, iPad and Android handset as surveillance cameras. I rigged one camera to the motion detector to watch my sick cat who, for reasons known only to her, has taken up residence in the downstairs bathroom. I also can detect if anyone has stepped inside the front door and the bedroom patio. A detailed instructional video walks you through the installation process, so I won’t repeat the steps outlined there, but overall, you first set up the gateway with your wireless router, pair it with the app via its bar code and then use a tab pulling mechanism to automatically connect with each hardware sensor you want to use. 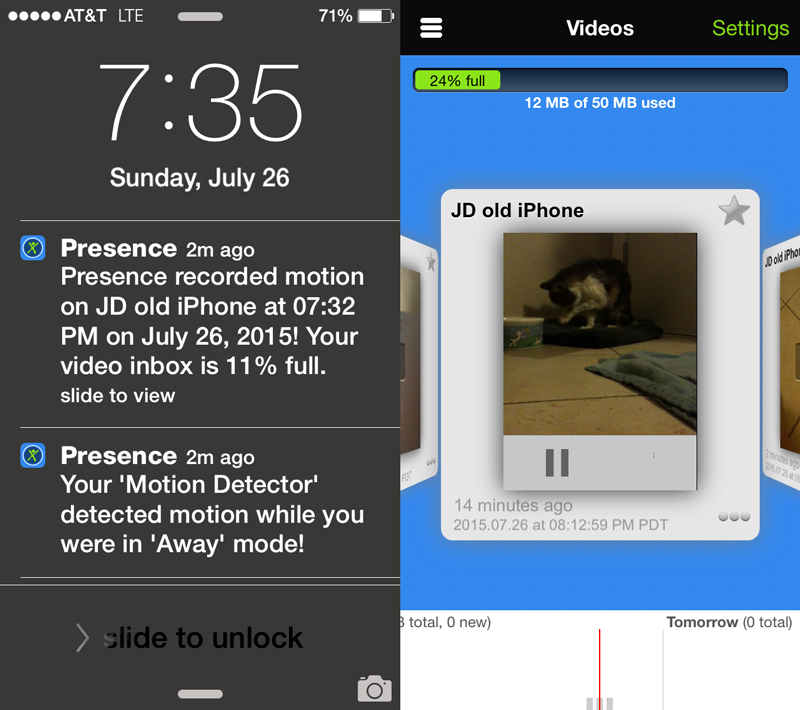 With an iPhone 3GS trained at my cat’s new hiding place, the app shot a 30-second video whenever she moved. The temperature monitor confirmed what I already knew: It’s way too hot in the house. Presence Security comes in three packs: Entry for $199, Security for $299 and Premium for $499. Each pack adds additional sensors to suit your needs, concerns and property. The Presence Store page has all the details, including additional hardware you can buy separately for the system. Estimated shipping for new orders is in August, according to the store page. The Presence app is available on Android and iOS, and resources are available on the Web with no monthly subscription fee.